Distal nephron acid secretion is mediated by highly specialized type A intercalated cells (A-ICs), which contain vacuolar H+-ATPase (V-type ATPase)-rich vesicles that fuse with the apical plasma membrane on demand. Intracellular bicarbonate generated by luminal H+ secretion is removed by the basolateral anion-exchanger AE1. Chronically reduced renal acid excretion in distal renal tubular acidosis (dRTA) may lead to nephrocalcinosis and renal failure. Studies in MDCK monolayers led to the proposal of a dominant-negative trafficking mechanism to explain AE1-associated dominant dRTA. To test this hypothesis in vivo, we generated an Ae1 R607H knockin mouse, which corresponds to the most common dominant dRTA mutation in human AE1, R589H. Compared with wild-type mice, heterozygous and homozygous R607H knockin mice displayed incomplete dRTA characterized by compensatory upregulation of the Na+/HCO3− cotransporter NBCn1. 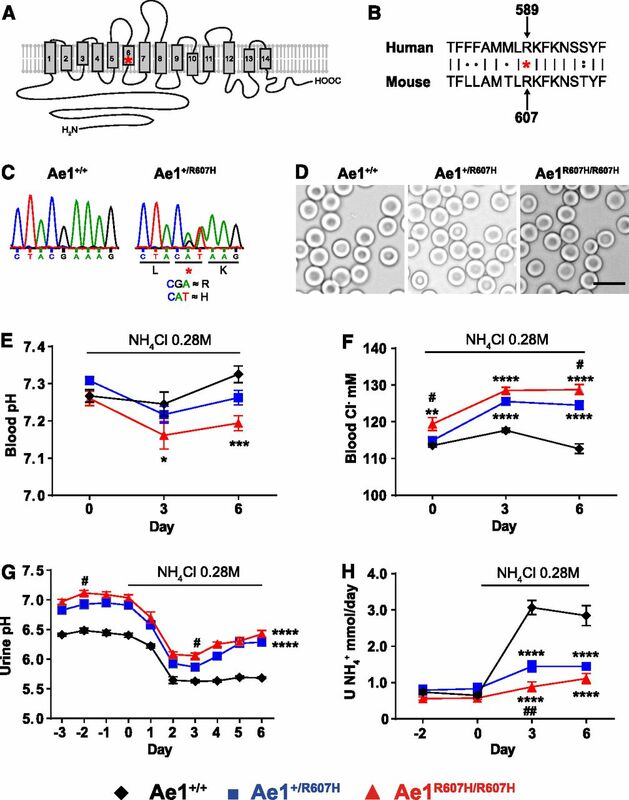 Red blood cell Ae1-mediated anion-exchange activity and surface polypeptide expression did not change. Mutant mice expressed far less Ae1 in A-ICs, but basolateral targeting of the mutant protein was preserved. Notably, mutant mice also exhibited reduced expression of V-type ATPase and compromised targeting of this proton pump to the plasma membrane upon acid challenge. Accumulation of p62- and ubiquitin-positive material in A-ICs of knockin mice suggested a defect in the degradative pathway, which may explain the observed loss of A-ICs. R607H knockin did not affect type B intercalated cells. 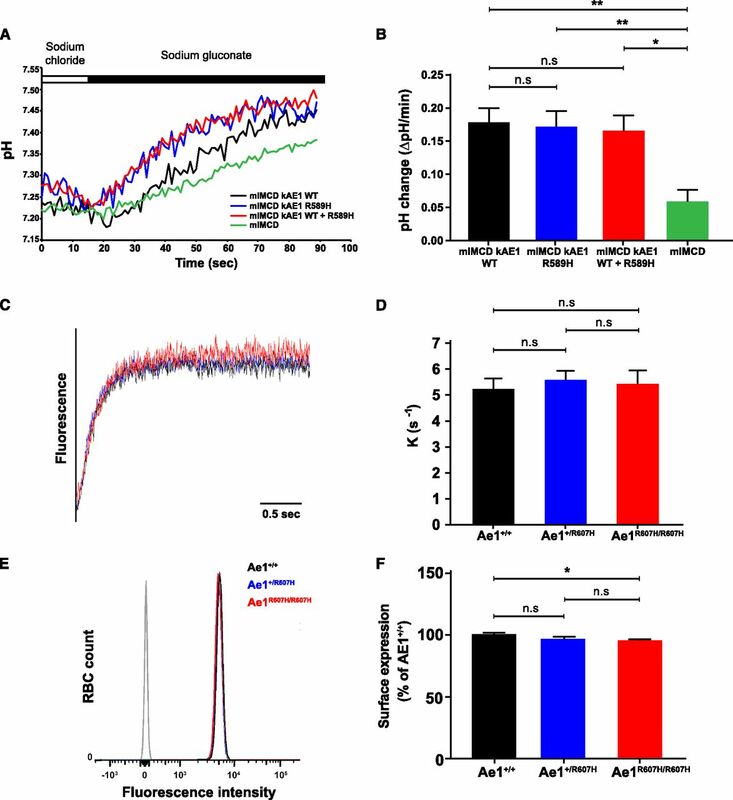 We propose that reduced basolateral anion-exchange activity in A-ICs inhibits trafficking and regulation of V-type ATPase, compromising luminal H+ secretion and possibly lysosomal acidification. To test this hypothesis in vivo, we generated mice expressing the variant R607H, corresponding to the human variant R589H. Both heterozygous and homozygous knockin mice exhibited incomplete dRTA, less severe in heterozygotes than in homozygotes. Targeting of Ae1 R607H to the basolateral plasma membrane of A-ICs was unexpectedly normal, as was transport activity in vivo. We further found that impaired targeting of the V-type ATPase and fewer A-ICs underlie impaired acid secretion in both heterozygous and homozygous knockin mice. We introduced the orthologous mouse Ae1 mutation R607H into murine embryonic stem cells by homologous recombination. The R607H mutation is located within transmembrane span 6, near its cytoplasmic end (Figure 1, A and B).8 Homologous recombination was verified by Southern blot analysis exploiting the HindIII restriction site within intron 14 (Supplemental Figure 1, A and B) and by sequence analysis (Figure 1C). Heterozygous and homozygous knockin mice were viable and appeared grossly normal. Body weight did not differ between genotypes (Table 1). Ae1+/R607H and Ae1R607H/R607H knockin mice show incomplete distal tubular acidosis. (A) Position of the human R589H mutation within the putative topology of AE1 first proposed by Barneaud-Rocca et al.32 and substantiated by the crystal structure.8 (B) Alignment of human AE1 R589 with murine Ae1 R607. (C) Introduction of the modified codon verified by Sanger sequencing. (D) Red blood cells of heterozygous and homozygous knockin mice displayed normal morphology. Scale bar: 10 µm. (E–H) After 3 days under standard conditions to determine baseline values, Ae1+/+ (n=6; black diamond), Ae1+/R607H (n=10; blue square), and Ae1R607H/R607H (n=8; red triangle) mice were acid-challenged for 6 days with 0.28 M NH4Cl in their drinking water. (E) Blood pH. (F) Blood [Cl−] in mM. (G) Urine pH. (H) Urinary NH4+ excretion. Data are presented as mean±SEM. *P<0.05; **P<0.01; ***P<0.001; ****P<0.0001 versus Ae1+/+ and #P<0.05; ##P<0.01 versus Ae1+/R607H (two-way ANOVA). As observed in humans with dRTA who are heterozygous for AE1 R589H, R607H knockin red blood cell counts and morphology were unaffected (Figure 1D, Table 1). Masson–Goldner staining of kidney sections did not reveal gross structural abnormalities (Supplemental Figure 1C), and Von Kossa staining revealed no nephrocalcinosis or nephrolithiasis by age 3 months (Supplemental Figure 1D). We next challenged male Ae1+/R607H, Ae1R607H/R607H, and wild-type littermates with 0.28 M NH4Cl in drinking water. All groups developed metabolic acidosis in response to NH4Cl administration, with decreased blood pH (Figure 1E) and plasma [HCO3−] (Supplemental Figure 2A), associated with increased blood [Cl−] (Figure 1F). Blood pCO2 was decreased independently of genotype, indicating respiratory adaptation (Supplemental Figure 2B). Urine pH decreased upon acute acid challenge. In wild-type mice blood pH (Figure 1E) recovered to baseline and urine pH remained low during sustained acid loading (Figure 1G) because of increased net acid (Supplemental Figure 2C), NH4+ (Figure 1H), and titratable acid excretion (Supplemental Figure 2D). In contrast, homozygous knockin mice exhibited a more marked renal acidification defect and were completely unable to recover from the acid load, developing persistent post-treatment metabolic acidosis with reduced body weight secondary to reduced water and food intake (Supplemental Figure 2, E–G). These data demonstrate incomplete dRTA in knockin mice, a phenotype compatible with, but of lesser apparent severity than that of patients with dRTA heterozygous for AE1 R589H.6 To identify potential compensatory mechanisms in knockin mice, we tested the expression of several acid-base transport proteins. We found no differences in NBC1 (Slc4a4), NHE3 (Slc9a3), or AE2 (Slc4a2) expression, but NBCn1 (Slc4a7; proposed to favor NH4+ secretion in the CD10) was strongly upregulated (Figure 2, A–E). The bicarbonate transporter NBCn1 shows a compensatory increase in Ae1+/R607H and Ae1R607H/R607H mice. (A) Protein abundance of pH relevant transporters NBC1, NHE3, NBCn1, and AE2 in protein lysates from whole kidney tissue under baseline conditions. Ae1+/+ (n=5), Ae1+/R607H (n=5), and Ae1R607H/R607H (n=4). (B) Quantification of NBC1, NHE3, NBCn1, and AE2 protein abundance. The abundance of NBCn1 is strongly increased in Ae1+/R607H and Ae1R607H/R607H mice. Data are presented as mean±SEM. ***P<0.001; ****P<0.0001 (one-way ANOVA). (C–E) Fluorescence intensity for NBCn1 is increased in the TAL of knockin mice. Ae1 (green), NBCn1 (red). Scale bar: 30 µm. As in wild-type mice (Figure 3, A and D), the kAe1 signal was clearly localized to the basolateral membrane in kidney sections of Ae1R607H/R607H mice (Figure 3, C and F, Supplemental Figure 3) indicating that normal targeting of the mutant polypeptide is preserved in both cortex and medulla. A typical basolateral signal was also obtained in Ae1+/R607H mice (Figure 3, B and E, Supplemental Figure 3). The immunolabeling intensity, however, appeared less pronounced in Ae1+/R607H and Ae1R607H/R607H mice. The R607H/R589H variant is correctly targeted to the basolateral plasma membrane. (A–F) High magnification images of cortical CD (A–C) and inner stripe of the outer medulla (D–F) in Ae1+/+, Ae1+/R607H, and Ae1R607H/R607H showing that Ae1 R607H is localized to the basolateral pole of A-ICs. Scale bar: 10 µm. 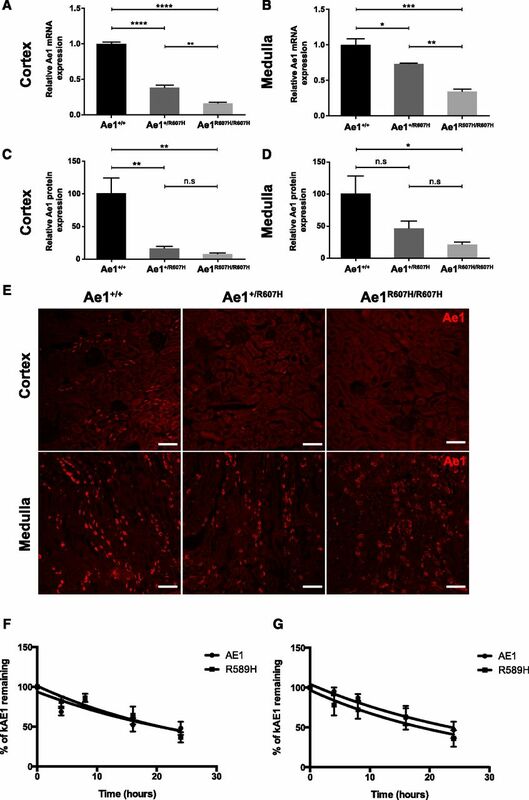 (G–I) The basolateral targeting of Ae1 R607H is evident from immunogold labeling in cortical A-ICs. Scale bar: 250 nm. (J–M) M1 (J and K) or mIMCD-3 (L and M) cells expressing either human kAE1 WT-myc (J and L) or R589H-HA (K and M) were grown to confluency for 7 days on semipermeable filters before fixation, permeabilization, and detection of kAE1 with either mouse anti-myc or anti-HA antibody, followed by Cy3-coupled anti-Ig (red). Nuclei were stained with DAPI. Scale bar: 10 µm. Ultrastructural analysis of immunogold-labeled kAe1 further supports normal targeting of the R607H variant to the basolateral plasma membrane (Figure 3, G–I), but with lower labeling intensity than in wild-type mice. This unexpected localization pattern prompted further examination of human kAE1 R589H targeting in M-1 cells (Figure 3, J and K, Supplemental Figure 3), derived from the mouse cortical CD, and in mIMCD-3 cells (Figure 3, L and M, Supplemental Figure 3), derived from the mouse inner medullary CD. In both cell models, targeting of kAE1 to the basolateral plasma membrane was unaffected by the mutation. These results differ from those repeatedly observed in polarized MDCK cell monolayers, and thus argue against the prevailing concept that trafficking or targeting defects underlie human autosomal dominant dRTA caused by the AE1 R589H mutation. Cl−/HCO3− exchange activity in IMCD-3 cells transfected with either wild-type kAE1, kAE1 R589H, or both was stimulated to similar extents upon extracellular Cl− removal (Figure 4, A and B), suggesting that the R589H variant does not impair Cl−/HCO3− exchange activity. Stopped-flow fluorimetry measurements10 of Cl−-dependent HCO3− influx in resealed red blood cell ghosts similarly showed no difference in anion-exchange activity among genotypes (Figure 4, C and D). Moreover, surface abundance of red blood cell eAe1, as assessed by FACS (Figure 4, E and F) and total red blood cell eAe1 content (Supplemental Figure 4) in mutant mice, were indistinguishable from corresponding values measured in wild-type red blood cells. The R607H/R589H mutation does not impair AE1-dependent chloride bicarbonate exchange activity. (A) Representative (BCECF fluorescence ratio) intracellular pH traces from Cl−/HCO3− exchange experiments performed on mIMCD-3, mIMCD-3 kAE1 wild type (WT), mIMCD-3 kAE1 R589H, or mIMCD-3 coexpressing kAE1 WT and R589H. The white and black rectangles above indicate incubations with NaCl and sodium gluconate containing solutions, respectively. (B) Transport rates of kAE1 WT, R589H, or WT and R589H mutant are all similar in mIMCD-3 cells. (C) Anion-exchange traces of resealed red blood cell ghosts. (D) Anion-exchange activity is identical in ghosts prepared from either Ae1+/+, Ae1+/R607H, and Ae1R607H/R607H mice. (E) Fluorescence intensity of FACS-sorted red blood cells labeled with anti-Diego antibodies directed against different extracellular AE1 epitopes. (F) Quantitative comparison of AE1 surface expression in red blood cells from WT, Ae1+/R607H, and Ae1R607H/R607H mice did not reveal differences among genotypes (n.s., one-way ANOVA and Tukey multiple comparisons test). Data are shown as mean±SEM from a minimum of three independent experiments. *P<0.05; **P<0.01 (one-way ANOVA). Ae1 transcript abundance was reduced both in the cortex (Figure 5A) and the medulla of Ae1+/R607H and Ae1R607H/R607H mice (Figure 5B), likely reflecting either decreased transcriptional efficiency, increased transcript degradation, and/or decreased A-IC numbers. AE1 expression is reduced in the kidney of Ae1+/R607H and Ae1R607H/R607H mice. (A and B) Quantitative RT-PCR shows that relative cortical Ae1 transcript abundance is only 40% of wild-type levels in Ae1+/R607H mice and 15% in Ae1R607H/R607 mice (A). Relative Ae1 medullary transcript abundance is 70% of wild-type levels in Ae1+/R607H and 35% in Ae1R607H/R607 (B). Data are presented as means±SEM; n=3 each. (C and D) Ae1 protein abundance analyzed in protein lysates from cortex and medulla, is drastically reduced in the cortex and only slightly less so in the medulla of Ae1+/R607H and Ae1R607H/R607 mice compared with wild-type. Data are shown as mean±SEM; n=5 per genotype. (E) Consistent with immunoblot results, Ae1 immunoreactivity (red) in cortex (upper panels) and medulla (lower panels) is decreased in Ae1+/R607H and Ae1R607H/R607H mice relative to that in Ae1+/+ mice. Scale bar: 75 µm. (F and G) Quantification of time-dependent relative AE1 abundance in M1 (F) and mIMCD3 (G) cells incubated with protein synthesis inhibitor, cycloheximide. Data are shown as mean±SEM; n=3 each. *P<0.05; **P<0.01; ***P<0.001; ****P<0.0001 (one-way ANOVA and Tukey multiple comparison). Taken together, the preceding experiments suggest that even though intrinsic anion transport activities (i.e., the activity per AE1 molecule) of mouse kAe1 R607H and human kAE1 R589H measured in transfected cell models are normal, basolateral anion-exchange activity in renal A-ICs might be severely compromised by a dramatic decrease of kAe1 expression in Ae1+/R607H and Ae1R607H/R607H mice. Because intercalated cell kAE1 and V-type ATPase are functionally coupled, we assessed targeting of the V-type ATPase B1 subunit in mice at baseline (Supplemental Figure 7) and after acid challenge (Figure 6, Supplemental Figure 8). After acid challenge, the B1 subunit localized almost exclusively to the apical domain of A-ICs in wild-type mice (Figure 6A). However, in Ae1+/R607H (Figure 6B) and Ae1R607H/R607H (Figure 6C) mice, this apical localization was severely compromised, suggesting altered proton pump targeting. Apical sorting of the proton pump is compromised in Ae1+/R607H and Ae1R607H/R607H mice. (A–C) The B1 subunit of the V-type ATPase of acid challenged wild-type (WT) mice almost exclusively localized to the apical domain of A-ICs in the cortex. In Ae1+/R607H and Ae1R607H/R607H mice, however, this shift to the apical domain did not occur, suggesting a secondary targeting defect of the proton pump in Ae1+/R607H and Ae1R607H/R607H mice. Scale bar: 10 µm. (D–I) Immunogold labeling of the (A) subunit of the V-type ATPase. (D–F) Overview of A-ICs from WT, Ae1+/R607H, and Ae1R607H/R607H mice. (G–I) Higher magnification view of the apical cell pole. Scale bar: 2 µm. (J) Renal cortex immunoblot shows reduced B1 subunit expression in both heterozygous and homozygous Ae1 R607H mice. Data are shown as mean±SEM. *P<0.05; ****P<0.0001 (one-way ANOVA and Tukey multiple comparison). Immunogold labeling of the A subunit of the V-type ATPase under baseline conditions confirmed decreased labeling of intracellular vesicles at the apical pole of A-ICs (Figure 6, D–I). In contrast, V-ATPase labeling was preserved in type B intercalated cells (B-ICs) and overall pendrin expression did not differ (Supplemental Figure 9). Total renal cortical B1 subunit abundance was decreased in acid-challenged mice, as judged by cortical membrane fraction immunoblotting (Figure 6J). We costained kidney sections for Ae1, pendrin, and the E-subunit of the V-type ATPase in wild-type and mutant mice (Figure 7A, Supplemental Figure 10). Importantly, all pendrin-negative cells that stained for the E-subunit, i.e., A-ICs, also expressed Ae1. Conversely, pendrin-positive B-ICs never costained with Ae1. In a separate experiment, we also costained for Ae1, pendrin, and Aquaporin 2, to identify principal cells (Figure 7B, Supplemental Figure 11). Whereas the number of A-ICs was dramatically reduced in the cortex of both Ae1+/R607H and Ae1R607H/R607H mice, the number of B-ICs and principal cells remained unchanged. Therefore, the proportion of A-ICs to B-ICs was significantly decreased (Figure 7C). This effect was even more pronounced after acid challenge (Figure 7D). Cortical CDs of Ae1+/R607H and Ae1R607H/R607H mice are depleted of A-ICs. (A) Costaining for Ae1 (red), pendrin (blue), and the E-subunit (green) of the V-type ATPase. Pendrin-negative cells that stain for the E-subunit also label for Ae1 and thus represent A-ICs. Scale bar: 25 µm. (B) Costaining for Ae1 (red), pendrin (blue), and Aquaporin 2 (green). Scale bar: 25 µm. (C and D) Quantification of A-ICs and B-ICs in the cortex at baseline (C) and after acid challenge (D). The number of cortical A-ICs is strongly reduced in Ae1+/R607H and Ae1R607H/R607H mice. (E) Cross-sectional area of individual A-ICs was increased in mutant compared with wild-type mice in the inner stripe of the outer medulla (ISOM). n=30 cells each. *P<0.05; **P<0.01; ***P<0.001 (one-way ANOVA and Tukey multiple comparison). We also estimated the size of A-ICs by measuring the areas of individual A-ICs in histologic sections, as described previously.13 A-ICs were enlarged in heterozygous and homozygous knockin mice (Figure 7E). Ultrastructural analysis of A-ICs revealed that the typical intracellular vesicles observed in A-ICs of wild-type mice (Figure 8, A, D, and G) were depleted in Ae1+/R607H (Figure 8, B, E, and H) and Ae1R607H/R607H mice (Figure 8, C, F, and I). 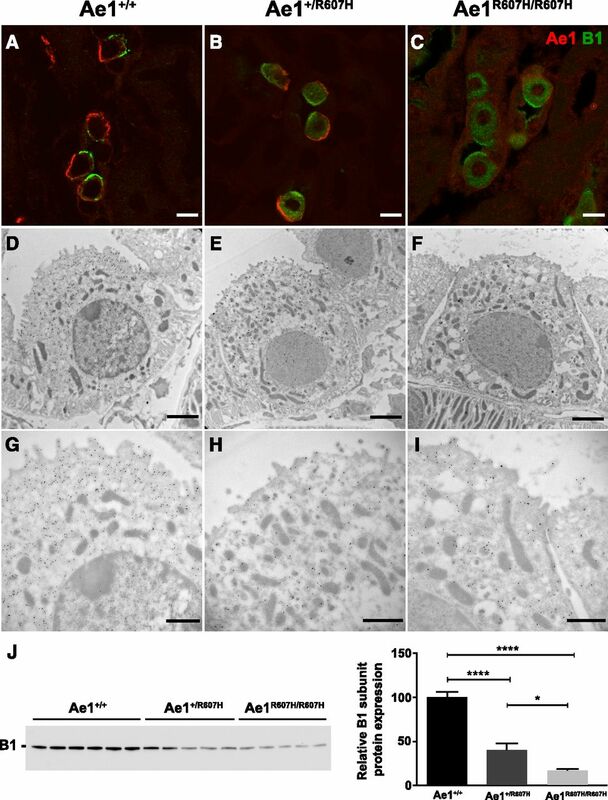 In contrast, the A-ICs of Ae1+/R607H and Ae1R607H/R607H mice contained numerous atypical lysosome-like vesicles reminiscent of autophagic structures (Figure 8, B, C, E, F, H, and I) and multilamellar bodies (Figure 8I). Type A-ICs accumulate p62-positive structures in Ae1+/R607H and Ae1R607H/R607H mice. (A–I) Compared with wild-type (WT) (A, D, and G) the ultrastructural architecture of A-ICs of Ae1+/R607H (B, E, and H) and Ae1R607H/R607H (C, F, and I) mice is characterized by a depletion of the regular intracellular vesicles (arrows) and accumulation of lysosomal inclusions (arrowheads) and multilamellar bodies (asterisks). Scale bars: 2 µm (A–C), 1 µm (D–F), and 500 nm (G–I). (J–L) Accumulation of p62-positive deposits in Ae1-positive cells in the renal cortex of Ae1+/R607H and Ae1R607H/R607H mice but not in Ae1+/+ mice. Scale bar: 25 µm. 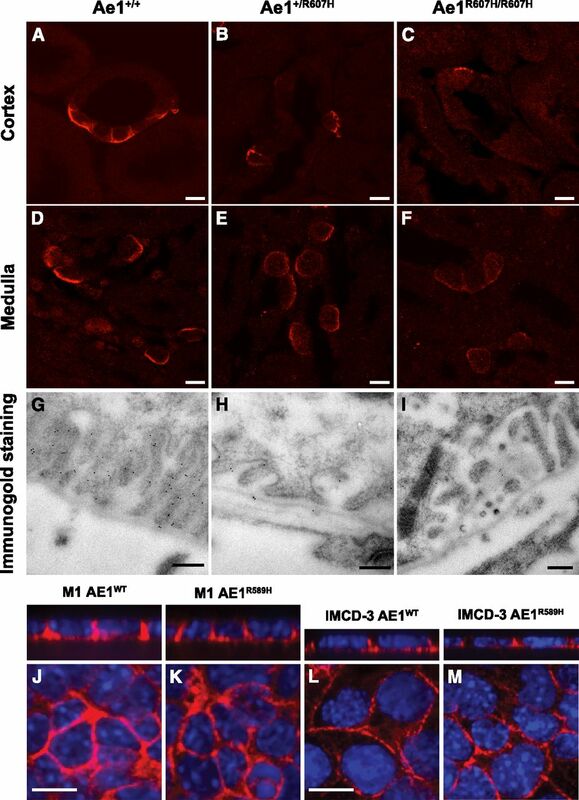 (M–O) p62-positive structures in the renal cortex of Ae1+/R607H and Ae1R607H/R607H mice partially colocalize with ubiquitin. Scale bar: 10 µm. To study the role of Ae1 in the kidney independent of the red blood cell phenotype, we modeled the most common AE1 mutation found in dominant dRTA patients, AE1 R589H, in mice. Ae1R607H/+ mice were unable to maximally decrease urine pH or to increase urinary excretion of ammonium and titratable acid in response to acid as compared with wild-type mice. Homozygous knockin mice were completely unable to recover from an acid load, developing a persistent metabolic acidosis after this challenge. The phenotype of R607H mice is mild compared with the usually complete dRTA observed in humans with the R589H mutation, although considerable variability of clinical presentation can be observed among affected individuals even within families.6 One possible explanation is diet, as the standard mouse chow provides a large net dietary alkali load,17 whereas the typical Western human diet constitutes a net acid load. Species-specific differences should also be considered, as these have been noted in other dRTA models, including the V-type ATPase B1 (Atp6v1b1) subunit knockout mouse generated on a mixed SVJ129/C57BL/6 background similar to that of this study.18 In apparent contrast to humans these mice exhibit compensatory upregulation of other transporters, because Ae1 disruption reduced Cl−/HCO3− exchange in isolated outer medullary CD by only 60%.4 We also identified NBCn1 to be upregulated in heterozygous and even more in homozygous knockin mice. Because NBCn1 is a basolateral Na+-HCO3− cotransporter of the medullary TAL, which favors NH4+ and acid excretion in response to chronic metabolic acidosis,10 it is likely that NBCn1 upregulation may contribute to the mild phenotype of Ae1R607H/+ and Ae1R607H/+ mice. Although a dominant or codominant mistargeting to the apical membrane was reported for a C-terminal truncation variant,19,20 the kAE1 R589H variant exhibited a dominant negative intracellular retention phenotype in confluent polarized MDCK cells,7 as well as in nonpolarized HEK-293 cells.11 In stark contrast to these results in MDCK cells, basolateral Ae1 localization was preserved in heterozygous Ae1 R607H knockin mice, as indicated by immunofluorescence and immunogold electron microscopy. Even in homozygous knockin mice, mutant Ae1 localized to the basolateral membrane without accumulation in a cytoplasmic compartment, strongly suggesting normal targeting of the pathologic R607H variant. Analysis in the cortical CD cell line M1 and the medullary CD cell line mIMCD-3 also revealed a predominant basolateral localization of the HA-tagged R589H variant. Previous studies have reported that recombinant kAE1 R589H expressed in Xenopus oocytes showed a 20%–50% reduction in Cl−/Cl− and Cl−/HCO3− exchange activity and did not display a dominant negative phenotype for anion transport when coexpressed with wild-type kAE1.6 Our stopped-flow fluorometric measurements of Cl−-dependent HCO3− influx in resealed red blood cell ghosts revealed no genotype-dependent difference in transport activity. Transport activity was also unchanged in IMCD-3 cells transfected with the R589H variant. In remarkable contrast to the red blood cell, Ae1 expression in the kidney was strongly reduced. This observation is consistent with a previous report of strong reduction or absence of AE1 staining in renal cortex from a patient with dRTA heterozygous for AE1 R589H.21 Thus basolateral bicarbonate efflux from renal A-ICs can be assumed to be reduced in correlation with the number of Ae1 alleles affected by the mutation. Taken together, the data suggest that the R607H variant (and by extension, the R589H variant in humans) may disrupt the normal trafficking of V-type ATPase to the plasma membrane and lysosomes in A-ICs. The latter may explain accumulation of p62/ubiquitin-positive structures, perhaps resulting in the decreased total number of A-ICs, which perpetuates the acid secretion defect. 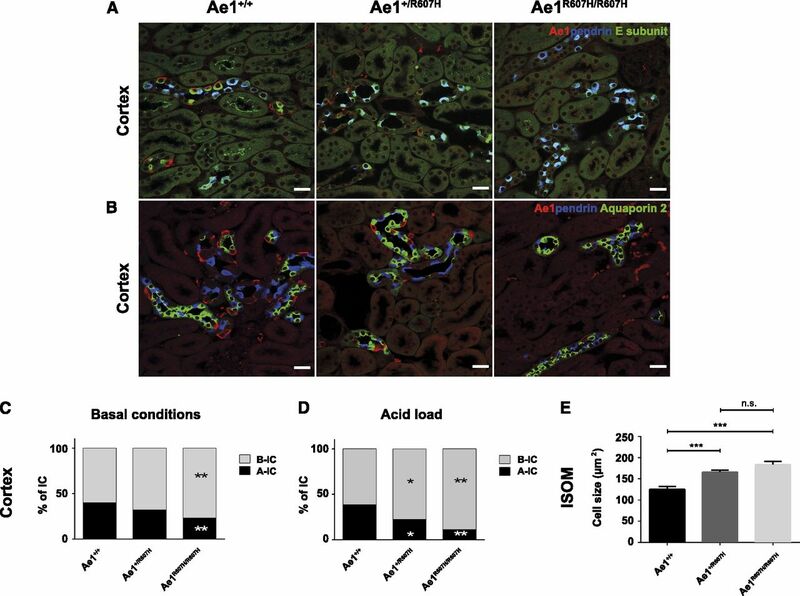 These findings illustrate the considerable, context-dependent complexity of AE1-related kidney disease. All animal experiments were approved by the Thüringer Landesamt für Lebensmittelsicherheit und Verbraucherschutz in Germany. The generation of Ae1 R607H mice is described in the Supplemental Material. Urine was collected daily under mineral oil after adaptation to metabolic cages (Tecniplast, Buguggiate, Italy). Urine pH was measured with a microelectrode (InLab Micro pH; Mettler Toledo, Viroflay, France). Retro-orbital blood was analyzed with an ABL 77 pH/blood-gas analyzer (Radiometer, Copenhagen, Denmark). Kidneys were fixed by retrograde perfusion of the aorta with 4% PFA in phosphate buffer and flash frozen in isopentane cooled with liquid nitrogen. The staining procedure and relevant antibodies are listed in the Supplemental Material. For electron microscopy, tissues were further fixed in 2% glutaraldehyde in 0.1 M sodium cacodylate pH 7.4 (Electron Microscopy Sciences, Hatfield, PA) and subsequently treated with osmium tetroxide (Electron Microscopy Sciences). Ultrathin sections were stained with lead citrate and uranyl acetate and examined in a JEOL 1011 transmission electron microscope (JEOL, Peabody, MA). Kidneys were placed in ice-cold PBS, homogenized, and membrane-enriched fractions were prepared by centrifugation. Proteins were separated by SDS-PAGE and blotted onto a nitrocellulose membrane. Membranes were incubated with the respective antibodies for immunodetection with Pierce ECL Western Blotting Substrate (Thermo Scientific, Waltham, MA), and analyzed by LAS 4000 ImageQuant (GE Healthcare, Waukesha, WI). Detailed methods are listed in the Supplemental Material. We are grateful to Katrin Schorr and Denis Arutyunov for excellent experimental support. We are indebted to Sebastian Frische for providing the rkNBC1, AE2, and NBCn1 antibodies. This study was funded by the Deutsche Forschungsgemeinschaft (Hu 800/8-1) and the Else-Kröner-Fresenius-Stiftung to C.A.H. ; a fellowship by the Interdisziplinäres Zentrum für klinische Forschung Jena to J.C.H. ; the Canadian Institutes of Health Research (MOP142251), the Kidney Foundation of Canada, the Stollery Children's Hospital Foundation through the Women and Children's Health Research Institute, and the Alberta Innovates Health Solutions to E.C. ; the International Research Training Group in Membrane Biology from the Natural Sciences and Engineering Research Council of Canada-Collaborative Research and Training Experience 414205-2012 program to R.M.L. and A.K.M.S.U. ; the Swiss National Science Foundation (31003A_155959/1) to C.A.W. ; the National Institutes of Health (DK042956), the Boston Area Diabetes and Endocrinology Research Center (DK57521), and the Massachusetts General Hospital Center for the Study of Inflammatory Bowel Disease (DK43351) supporting the Program in Membrane Biology Microscopy Core facility to D.B., T.G.P., and D.E.C. ; the European Renal Association-European Dialysis and Transplant Association (ERA-EDTA) LTF41-2013 to F.T. ; the l’Agence Nationale de la Recherche (ANR) ANR BLANC 14-CE12-0013-01/HYPERSCREEN; the grants Evaluation-orientation de la Coopération Scientifique/Comisión Nacional de Investigación Científica y Tecnológica (ECOS/CONYCIT) France-Chile 2014 and CHLORBLOCK from the Initiative d'excellence (IDEX) Sorbonne Paris Cité to D.E. N.P. was supported by the Fondation du Rein, the French Nephrology Society sous égide de la Fondation pour la Recherche Médicale and by ANR grant 15-CE14-0024-02/ConTarKiD. R.M., F.T., J.C.H., A.K.H., and B.S. contributed equally to this work. This article contains supplemental material online at http://jasn.asnjournals.org/lookup/suppl/doi:10.1681/ASN.2016020169/-/DCSupplemental.